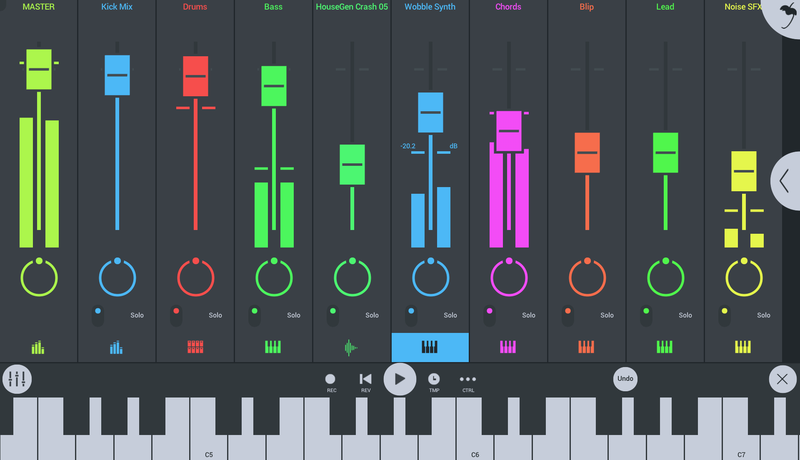 FL Studio Mobile by Image Line is a Mobile Audio App. 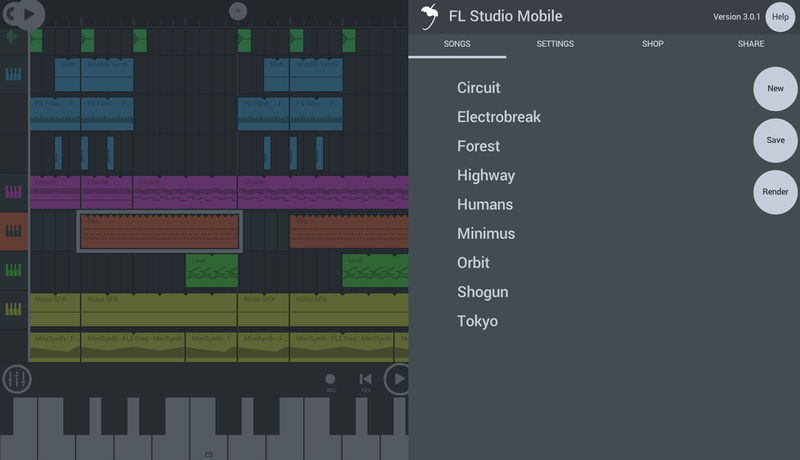 FL Studio Mobile: For Android devices. FL Studio Mobile: For iPhone, iPod Touch & iPad. 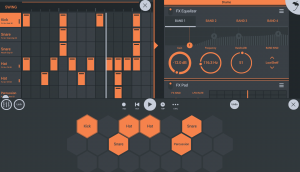 FL Studio Mobile: For Windows 8 and 10 App. 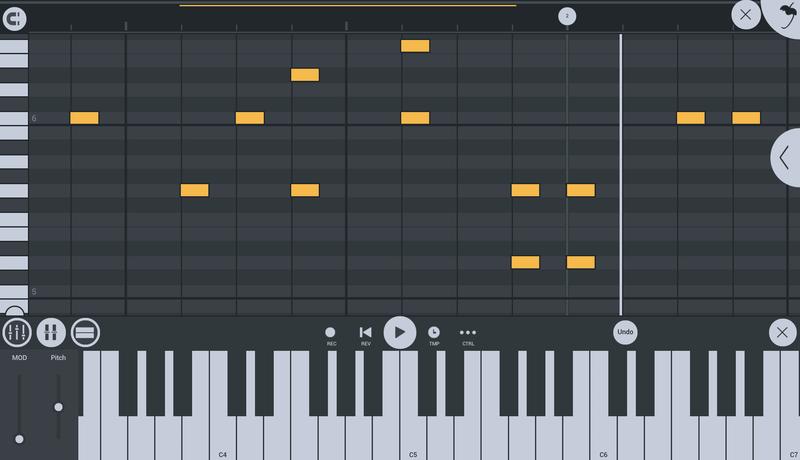 FL Studio Mobile: FL Studio native plugin format. 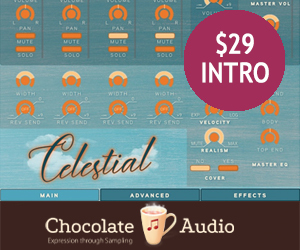 Advanced Sound Creation - Use high quality synthesizers and samples. 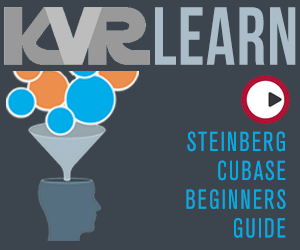 Step sequencer - Fast percussion programming. 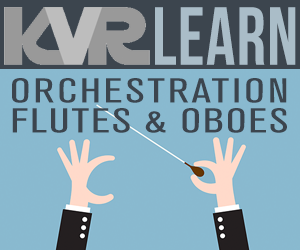 Touch controllers - Configurable virtual piano-keyboard & drum pads. 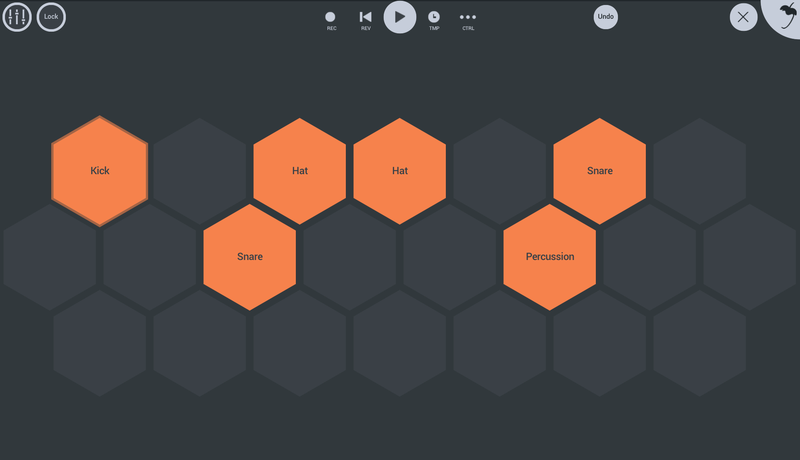 MIDI control - Play instruments and link to knobs/sliders. 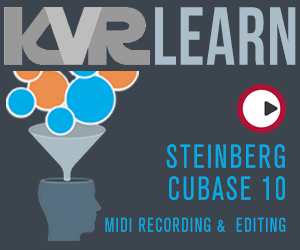 Audio recording - Capture live performances. Browser - Preview samples and presets. High quality audio engine - Optimised for low CPU load. Mixer - Per-track mute, solo, effect bus, pan and volume adjustment. 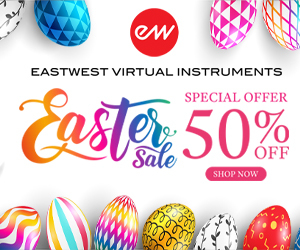 Effects - Auto Ducker, Chorus, Compressor, Limiter, Distortion, Parametric Equalizer, Graphic Equalizer, Flanger, Reverb, High-Pass/Low-Pass/Band-Pass/Formant (Vox) Filters, Delays and Phaser to enhance your mix. 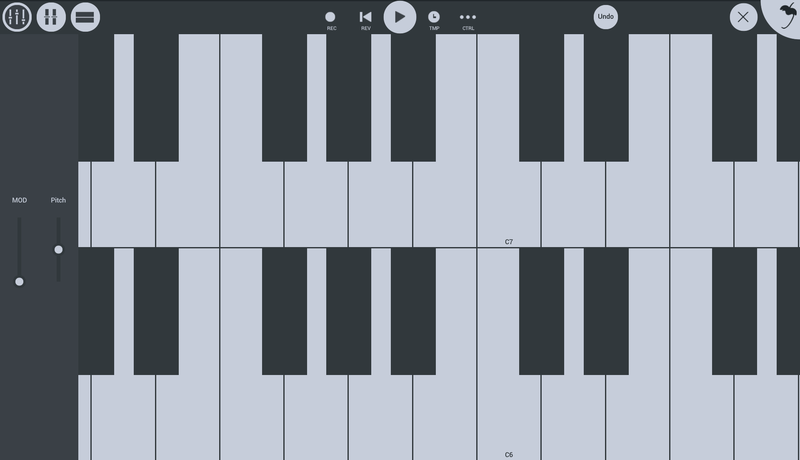 Piano roll - Enter notes & chords or to edit recorded performances. Flexible interface - Works with all screen resolutions and sizes from phone to TV. Export formats - Save to WAV, MP3 or AAC, MIDI. Easy project sharing - Sync to other FL Mobile devices / installations over your network. 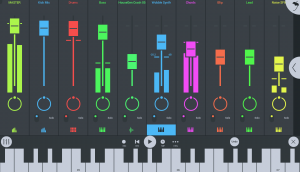 FL Studio plugin - Use the FL STUDIO free Plugin Version of this App. VIDEO: FL Studio Mobile 3 | Getting Started. 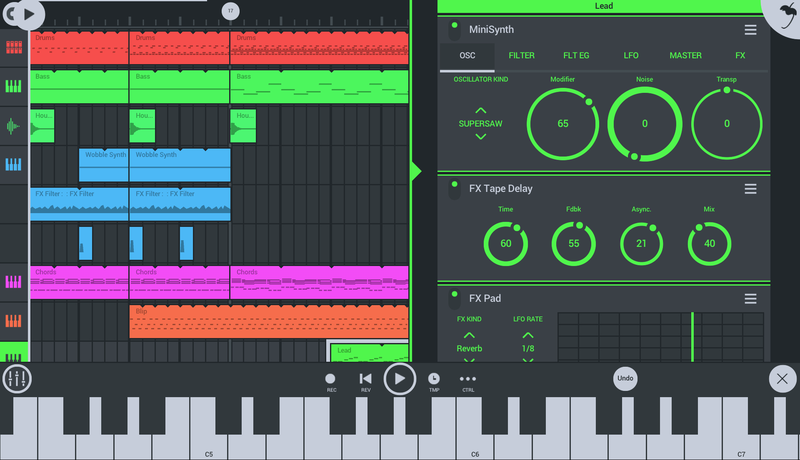 Being a long-time FL Studio user, I bought FL Studio Mobile as soon as it was available for Android - and was completely unimpressed. Far from being 'the fastest way from my brain to my speakers' it felt fiddly and clunky, bore no resemblance to FL Studio (obviously there was a reason for that), and was plagued with timing issues. So it sat on my tablet, unused, while Caustic got all the work. While spring-cleaning my tablet the other day, I went to take one last look at it before uninstalling, just to be sure... and saw the version 3 update for the first time. And my goodness, what a difference! FLSM3 has the best workflow I've seen in a software studio - without any help or tutorials I'd put half a (polished) track together in just a couple of hours, and it's all uphill from here! Interface: All vector, simple, minimal*. Playlist and piano-roll editing is very 'touchscreen friendly' with just the right balance of snapping and slip editing to keep note entry in check while on a bumpy bus ride. Clips in the playlist are easily copied/pasted/truncated to build up arrangements, while remaining individually editable. It's amazing what IL have been able to strip out of a DAW interface while leaving everything so usable - the mixer in particular is among the barest I've seen, with controls like EQ being consigned to optional channel effect modules rather than cluttering up precious screen real estate if they're not needed. Things like instrument and velocity controls are kept out of the way as pull-out panels. Capability: Everything can be automated, basic editing functions are intuitive so both the piano roll and playlist are quick and flexible to work with, no timing or stability issues*. Supports MIDI and audio (haven't played with these yet). App is mirrored by a VST plugin, so projects can always be continued in a full-scale DAW - this is not necessarily just a 'scratchpad'. * Limitations: Needs a CPU meter. There's a shortage of stereo movement effects - eg. delays don't have a ping-pong option, there's no channel width effect. I'd like to see numeric values on all instrument controls, as it's tricky to set near-zero values using a slider that completely disappears under your finger. And it needs support for more time signatures - why so many music apps launch without such a fundamental feature is beyond me. Bottom line: Caustic is still cool, but FL really is the fastest way from my brain to my speakers now - well worth a (second?) look. 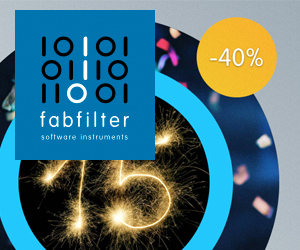 Step sequencer with up to 24 drums per track. Export to soundcloud and AudioCopy. Record pitchbend / filter sweaps by tilting the iPad. Access to the user forum from within iPad. Only a sampled selection of presets from their plugins. No help provided at all. 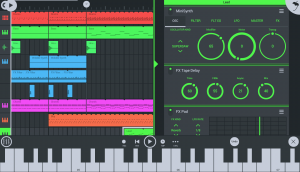 Image-Line has taken FL Studio from the PC platform to iOS devices, but is it as good as it is on the PC? Let's find out shall we? Now first you need to know that I haven't used FL Studio mobile Pro mostly due to the piano roll. It's really disconcerts me to see how under developed it is. More on that later. It starts off with a nice with the classic step sequencer people is used to in FL Studio 10. It is very easy to lay down a drumloop which takes less than a minute to do. Playing it, and it sounds pretty good. Time for a rhodes piano. And what do I find? They haven't included a sampled rhodes piano. They've provided a sampled synthesized rhodes piano that ofcourse sounds pretty realistic, as far as synthetics goes that is. You cannot adjust the length of the note other than predefined lengths. You cannot adjust the velocity on a per note basis. You can however set the volume for a selected group of notes. It would've been better if you tapped where a note should be placed, tapp again to resize the note, and double tapp again at the note to erase it. The song editor is clip based, you don't even have blocks in iPad to start with. Now I've addepted to use clips, so this is not an issue for me anyways, but you cannot as far as I know remove a single bar in the midst of a song. FL Studio comes with some pretty rudimentary effects (limiter, reverb, delay, eq, amp, and filter) which sounds quite good.I don't know if they work on a track to track basis, but I think so anyways. The filter uses the accelerometer to record the filter, which is quite fun to do, tilting the iPad around almost dropping it in the process. 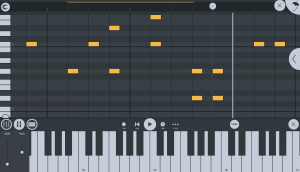 Regarding the sounds: FL Studio mobile uses samples for everything. 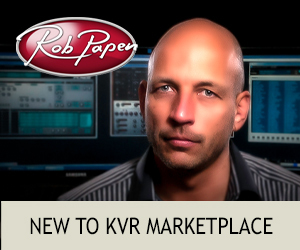 There is no virtual plugins to use here, only a sampled selection of presets from them. You cannot load your own samples, but you can create samples from other sequencers on the iPad that supports AudioCopy. You can save projects in flp format, as well as export to wav, aac, and even upload directly to soundcloud no less! 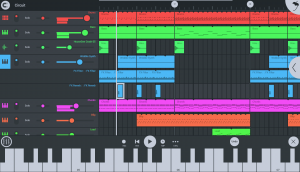 Is FL Studio mobile worth getting? Yes and no. Yes for their step sequencer. No because of their song / piano roll which really lacks a lot that FL Studio has on the PC. Maybe I'm a little bit too hard on FL Studio, 15 years ago I would've loved to work with such a tool, because back then I didn't have FL Studio. If you can live with the limitations that you get in FL Studio, then go for it. And as for the price of FL Studio mobile Pro I paid around €20 for it, it's more like worth €7.50. In the FL Studio Mobile HD current version you can add and remove bars in the middle of a song. Note lengths are also not restricted anymore. So some improvements have been done by Image Line. I find FL Studio Mobile to be my favorite sequencer in iPad. I also own NanoStudio, Beat Maker 2 and Music Studio. 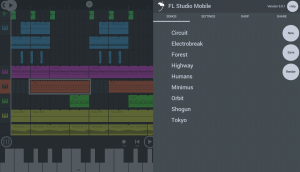 All of these have their strengths, but FL Studio Mobile is a good choice if you do modern electronic music and use it only to quickly sketch your ideas and then export the MIDI data to your computer to finish your songs. NanoStudio on the other hand has a decent VA synth and has better routing / chaining of effects and a decent mixer view. It can definitely be a better choice if you want to make a finished /polished song with your iPad. But if you're going to import the MIDI into your main DAW anyway, I can't really see any point spending time tweaking synth sounds with iPad. 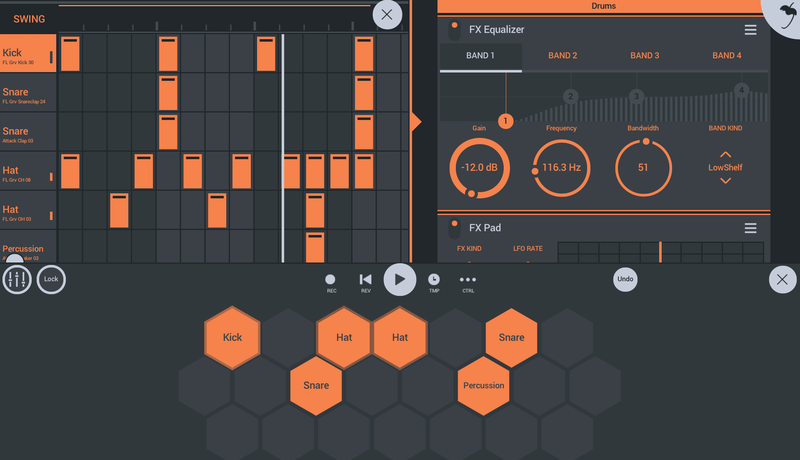 Beat Maker 2 has better audio editing options and supports virtual midi. 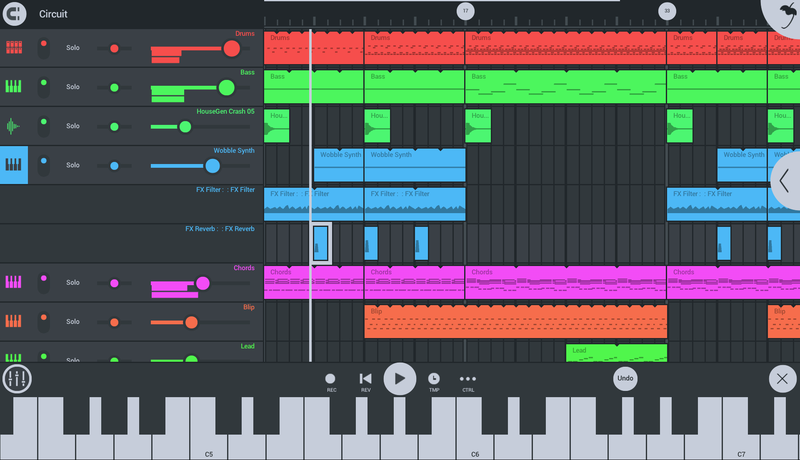 Music Studio is pretty much same as FL Studio Mobile. It has better acoustic instrument samples but lacks in modern synth, bass and drum samples. It also doesn't have drum sequencer but it has buttons/pads to trigger chords. Agreed. I have the other software you mention, although I do have a big passion for nano studio. FL mobile is great for creating and sketching new ideas.